So when my sister recommended The Little Larder recently I was taken back to stories from my last job where a colleague would Facebook photos of her all day breakfast with lewd tomato sauce messages written on her plate by her friend the waitress. The waitress and the colleague have moved on, but the story remains and makes me laugh. Even though it was the weekend and busy, we were served promptly and our meals didn’t take too long. My sister ordered pesto scrambled eggs with salmon, so I didn’t photograph it, but I ordered the mushroom polenta with avo and poached eggs and a beetroot, carrot and orange juice. 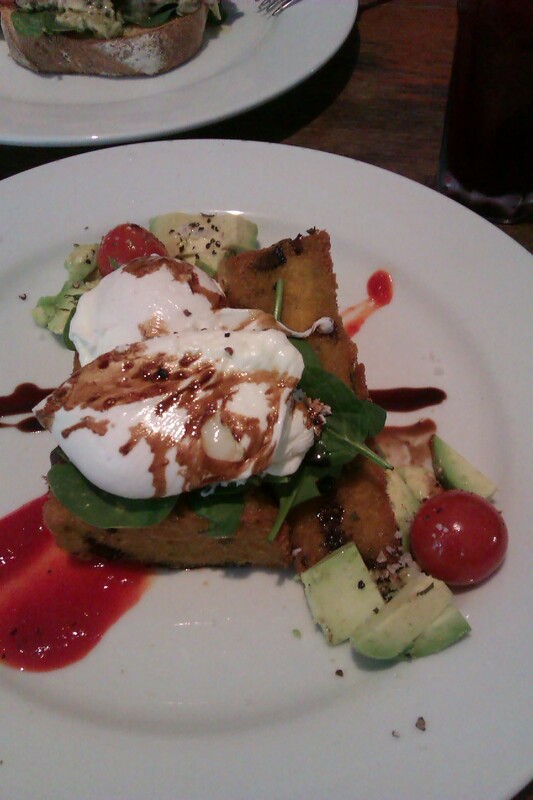 The poached eggs were a little undercooked in my fussy opinion but the polenta was superb and with the balsamic, cherry tomatoes and hot sauce, was truly interesting and yummy. You’re going to pay New Farm prices here with most hot brekkies over $15 each. We finished with a stroll around New Farm, acting like complete tossers and behaving in a way that only sisters could probably understand. If you and your sister swear a lot and talk about Brisbane gigs, architecture, libraries and boys. So exactly like you and your sister.